This lasagna recipe is easier than the traditional lasagna recipe simply because there is no ricotta cheese layer at all. Instead, oven-ready lasagna noodles are layered in the slow cooker with your favorite jarred marinara sauce and both mozzarella and cheddar cheeses and then cooked away. 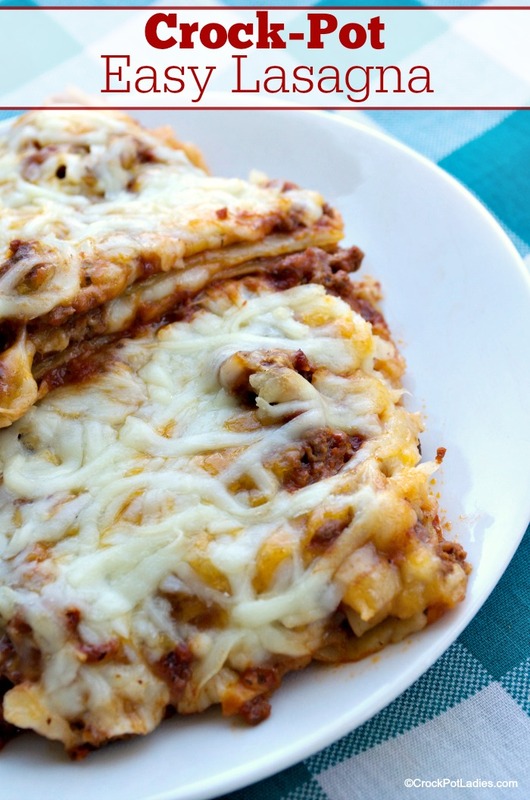 With only 5 ingredients this is a super easy version of lasagna and tastes great too! Serve this slow cooked easy lasagna recipe with a nice side salad and perhaps some garlic bread for a complete dinner that the whole family will love! 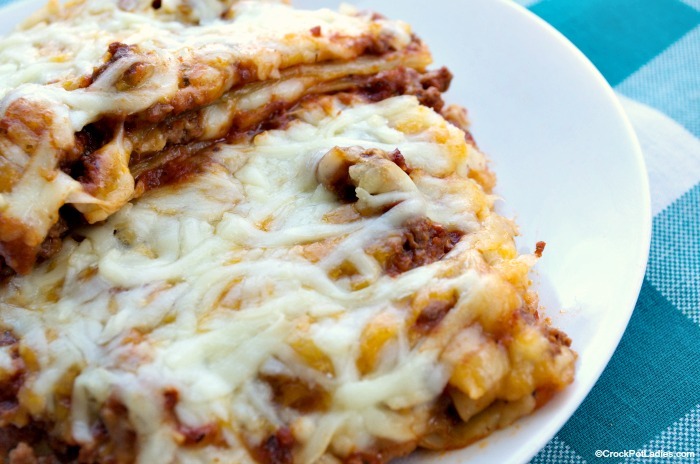 With just 5 ingredients this slow cooker lasagna recipe comes together super quick. Serve with a side salad and garlic bread for a dinner the whole family will love! In a medium skillet, cook and crumble the ground beef over medium-high heat on the stove top until no longer pink. Drain off excess fat and add the marinara sauce skillet and stir to combine. Spray a 3.5 quart casserole OR a 6 quart oval slow cooker with non-stick cooking spray (or line with a slow cooker liner) to make removal of the cooked lasagna easier. Spoon a thin layer of the meat sauce in the bottom of the slow cooker and spread evenly. 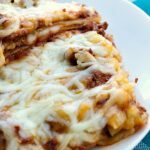 Add a layer of no-bake lasagna noodles, breaking them in half if needed to make them fit in the slow cooker. Add another layer of the meat sauce on top of the noodles. Add a layer of both mozzarella and cheddar cheese. Add another layer of meat sauce, a layer of noodles, and another layer of meat sauce and then a final layer of cheese for the very top layer. Cover and cook on LOW for 4 to 5 hours or until the noodles are tender. To make this recipe gluten-free Barilla makes a great Gluten-Free Oven-Ready Lasagna Noodle. Use their product locator found on their website to see what stores carry these GF lasagna noodles or you can purchase them online at Amazon.com. 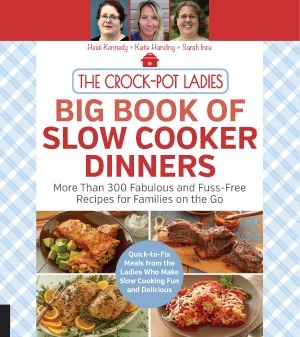 Tried alot of your dishes for crock pot and everyone has turned out wonderful. Keep up the good work. Thanks so much Donna, so glad you have enjoyed them! Is the nutritional information on the bottom of the recipe for the entire recipe, or per serving?